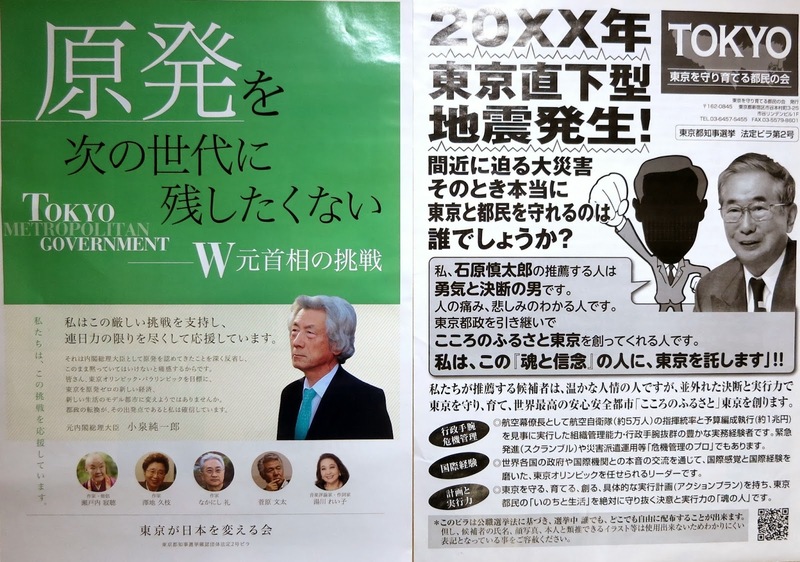 Campaign flyers for Tokyo Metropolitan District Governor's election. Left: Hosokawa Morihiro. Right: Tamogami Toshio. Click on image to open in large format. This morning, election morning, the residents of the Tokyo Metropolitan District will be waking up to a city covered with a record-breaking but rapidly melting mass of snow. Fitting is it that a brief, intense and yet somehow empty gubernatorial campaign season ends with the metropole stuck beneath in a cold, damp white blanket. Former Minister of Health, Labour and Welfare Masuzoe Yo'ichi seems guaranteed victory. He managed to campaign without controversy, on what seemed to be the unchallenging proposition, "Yes, I am good enough." And "good enough" seems indeed good enough to prevail, if enough of the electorate tramps out in the snow to the election centers. Former Prime Minister Hosokawa Morihiro ran on the premise of "Utsunomiya Kenji, the anti-nuclear candidate, is too uninspiring to win" -- which might be true. However, Hosokawa turned out to be even less inspiring Utsunomiya or indeed any reasonably animate human being. Despite the electric jolt of having former prime minister Koizumi Jun'ichiro as buzz creator, Hosokawa's campaign was pretty much dead on arrival. As Okumura Jun pungently put it, "at least the Vasa sailed 1300 meters before it sank, much better than Hosokawa's candidacy." - Link). Utsunomiya Kenji's candidacy needed more time. This seems weird for a candidate who did not stop running for the governorship even after losing to Inose Naoki in a landslide. In the year after finishing a distant second, Utsunomiya made 130 public appearances, as if he knew he was going to get another shot at the governorship soon. 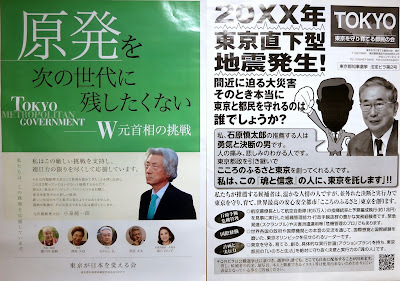 Of all the candidates, only Utsunomiya was ready from the git-go, his posters appearing in my mailbox the first day of the campaign season. As the campaign season progressed and voters could take a look at him his candidacy became more credible -- especially in contrast to Hosokawa's. However, the presence of two strong anti-nuclear candidates, one supported by the traditional left parties, one not, divides the progressive and nuclear-phobic vote, meaning Utsunomiya seems destined to finish second again. The candidature of former Air Self Defense Forces Chief of Staff Tamogami Toshio has been a travesty from beginning to end. The man has no business running for a local assembly seat, much less the governorship of the world's mightiest megalopolis. The news media, which should have buried him on the first day under a mountain of ugly facts about him and his followers, instead have at times seemed gleeful enablers of his candidacy. He will end up with an entirely revolting number of votes, most of which will come from voters who know next to nothing about him. The voters of Tokyo, of course, have a right to feel robbed. In the build up to former governor Inose Naoki's resignation, the parties and the news media speculated about a whole raft of potential candidates, pretty much any of whom could have prevailed against the current core quartet. On the Liberal Democrat Party side, the potential nominees included Environment Minister Ishihara Nobuteru (whose home was literally around the corner from mine way back when in Suginami-ku), Education Minister Shimomura Hakubun (like he would ever give up that portfolio), former Finance Ministry bureaucrat/Koizumi assassin/Mr. Masuzoe and self-image train wreck Katayama Satsuki and former multiple Winter and Summer Olympian Hashimoto Seiko (I am sure Senator Hashimoto much prefers being where she has been, marching at the head of the Japan delegation at the Sochi games). On the Democratic Party of Japan side there was discussion of nominating of Nagatsuma Akira, the bureaucracy's bête noire. Of December's would be candidates, there was one potential matchup that would have really sizzled. If only the Abe Shinzo LDP had put its reputation on the line by following up on the rumors and nominating Koike Yuriko to be its champion, with the Democrats responding in kind with Ren Ho. That would have been a battle for the ages, pitting sharp looks with sharp minds and even sharper tongues -- and one worthy of the prize that is Tokyo.